SIBM Bengaluru witnessed yet another year of excellent placements for the class of 2014 where we saw huge participation from companies across sectors. The placement process has been successfully completed with students placed across various sectors and functions of their choice. The successful completion of recruitment cycle 2013-14 stands testament to the high quality of students at the institute and robust nature of the placement process that provides adequate flexibility to both students and recruiters. This makes SIBM Bengaluru a force to reckon with in the corporate world. True to our title, the Birthplace of Business Leaders, SIBM Bengaluru has created a niche in the minds of the recruiters looking for passion-driven talent and engaging minds. Defying all the economic uncertainty and the market conditions, 65% recruiters visited campus for the first time which includes prominent brands like D. E. Shaw, Air Asia, India Forex Advisors Private Ltd, The Smart Cube, Puma, Skoda, SAP Labs and Jubilant MotorWorks. The performance and the calibre of the students exceeded the expectations of the corporate who acknowledged the results of academic rigor and industrial interaction through various projects and events. The Final Placements Process has already seen companies offering coveted roles in their organizations. The ever increasing participation of companies in the placements process is testimony to SIBM Bengaluru creating excellent managers year after year. 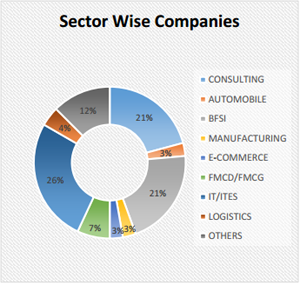 Companies gave offers across various functions like Corporate Finance, Equity Research, Financial Services, B2B Sales, Sales & Business Development, HR Generalist and Consultancy. In just 5 years, SIBM Bengaluru has been able to attract market leaders in their respective segments to its campus for recruitment and we are committed to being the most preferred choice for recruitments in the coming year. Bajaj Auto Finance HCL Syntel Ltd.
Financial Roles like Corporate Finance, Equity Research, Financial Consulting, Credit Analyst, Credit Rating and Financial Operations were offered by companies like D.E. SHAW, J.P.Morgan, CRISIL, Goldman Sachs, SBI Life, etc. 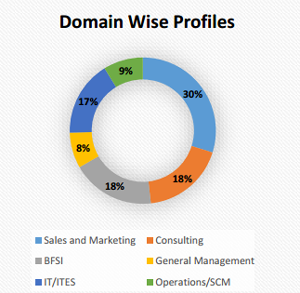 B2B Sales, Key Accounts Management, Marketing & Business Development roles were offered by some of the majors like Air Asia, Adobe, Bajaj Allianz, Fidelity, J.P. Morgan, Genpact, Zomato, Religare, Tata Motors, Accenture, HP Analytics, etc. Recruiters like Actuate Business Consulting, Zinnov Management Consultancy, Entercoms&Jda Software offered consultancy roles in different domains like Technical, Supply Chain, Quality Excellence, Strategy and Management. Sequel Logistics, Genpact, Fidelity were some of the other companies which offered roles in operations. Companies like Deloitte, HCL and Genpact offered roles such as HR Analyst, Consulting and Human Capital Advisory for students in HR.